Grave-top gifts for little girl buried in rum keg. There are several variations of the story about a young girl who became ill at sea during a voyage home from England with her father. When the girl's illness took a turn for the worse and she died, her father kept his promise to his wife to bring their daughter home by preserving the child's body in a cask of rum. Upon returning home, the little girl was buried - still in the rum cask - at the Old Burying Ground Cemetery in Beaufort. 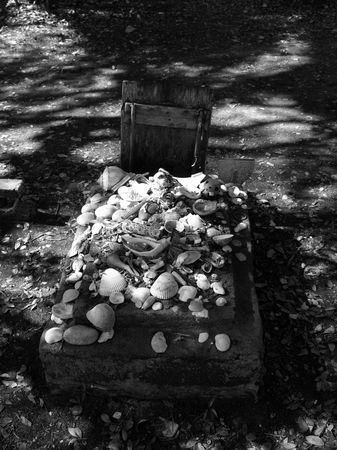 Visitors leave gifts of shells, toys, and small items on top of her grave, which is marked by a piece of wood. People claim to have seen a little girl playing in the cemetery at night. It is also said that she sometimes leaves a toy or one of her gravetop gifts in another area of the cemetery. The little girl in the rum cask is not the only spirit that roams this graveyard, which was deeded to the town in 1731. The cemetery is also the final resting place of Revolutionary and Civil War soldiers, settlers killed during the Tuscarora Indiian War of 1711, and other souls of Beaufort's past.